Canada's competition watchdog is looking into whether or not WestJet's discount carrier Swoop has been offering airline tickets at below cost to push rivals out. Canada's competition watchdog is looking into whether or not WestJet's discount carrier Swoop has been offering airline tickets at below cost just to push rivals out. As first reported by Ottawa-based political publication Blacklock's Reporter, the Competition Bureau of Canada has begun an investigation into whether or not Swoop has engaged in what the bureau calls "predatory pricing" — selling tickets for less than it costs to run the flight, in the hopes to drive other competitors on that route out of business. Swoop was launched with much fanfare earlier this year, featuring rock-bottom prices between Canadian cities including Halifax, Edmonton, Winnipeg, Hamilton, and Abbotsford, B.C., along with a handful of sunny destinations in the U.S., Mexico and the Caribbean. 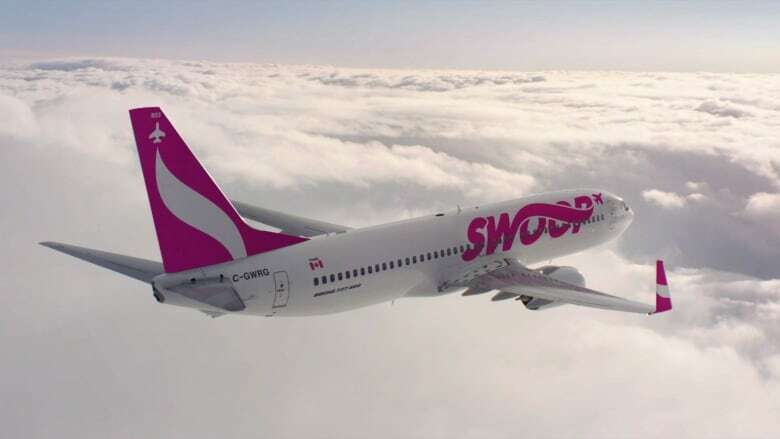 Some of those routes were already being served by other small Canadian carriers, including Flair Air, when Swoop began an aggressive price war that saw one-way ticket prices drop below $40 in some cases. Flair subsequently cancelled some of its routes, because they couldn't make any money on them, but took exception to Swoop's tactics and complained to the bureau. On Tuesday, the bureau sought and obtained numerous court orders related to the case. The routes under investigation include three routes out of Edmonton: one bound for Hamilton, Ont., one to Winnipeg, and one to Abbotsford, B.C..
"There is no conclusion of wrongdoing at this time and no charges have been laid," the bureau told CBC News in a statement. For its part, Flair said it is willing and eager to participate fully in the investigation. "We are pleased that the Competition Bureau has taken our concerns seriously and launched an investigation into the pricing practices of one of our key competitors," Flair Airlines chief executive Jim Scott said. "Our efforts to bring sustainable low fares to Canada have been hindered by these anti-competitive pricing practices." Swoop is owned by WestJet. Responding to a request for comment from CBC News, WestJet spokesperson Lauren Stewart said: "WestJet and Swoop are presently compiling information in answer to the bureau's inquiry and will not be providing further comment at this time." Altacorp Capital analyst Chris Murray says that comments by WestJet management on conference calls and during investor presentations about not wanting to allow another market entrant could be coming back to bite the company now. "Any finding could create a monetary penalty or impact the company's continued rollout of its Swoop ultra-low cost carrier division, impacting growth and earnings in 2019 and beyond," he said. Even if the investigation leads to no negative findings against the company, it's likely to hang over the business in the short term, he said. "We see this impact as negative with the cost and distraction of the action adding to the challenges for the company in the coming year," he said.